Rupert Murdoch Apologises For OJ Project! Is O'Reilly Next? 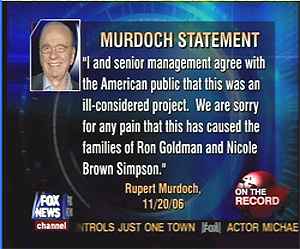 Rupert Murdoch canceled and apologised for the sick and twisted OJ project. I believe Bill O'Reilly owes us an apology as well since he called us all Kool-Aid zombies and far left fanatics for pointing out his ties to News Corp..
Obviously Fred is a bit slow. FOX News has nothing to do with the Simpson situation. And Fred doesn’t believe I am a man of principle either. He’s a Kool-Aid zombie doing the bidding of far left fanatics who will do anything to disparage me and FNC. The so-called elite media is tiptoeing around the fact that Simpson’s being paid millions to exploit the murders of his ex-wife and Ronald Goldman, murders he probably committed. The New York Times covered the story in its business section. “CBS Evening News” didn’t even mention it for the first two days. But the tabloid press and cable news are fully engaged. The far left loons are also out in force as their Internet masters urge them to tie the FOX News channel in with the Simpson situation. I’ve received scores of letters like this one from Fred in Indianapolis.